GM Kuzma submitted this photo and caption. After a very hectic day of rehearsing at Des Moines Area Community College, the Blue Knights got a break before the show with some nice weather. 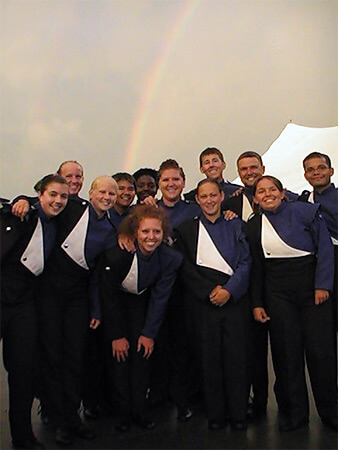 Here are members of the front ensemble posing in front of one of several rainbows that evening in Ankeny, Iowa. The sky cleared just as the Blue Knights took the field for a standstill exhibition. It was a beautiful sight and a great performance!